The Mission Table is a pleasure to own. The mortise and tenon joinery will assure that the table will last for generations. 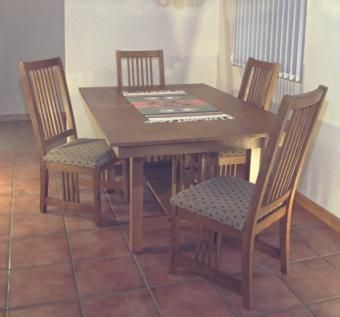 With the center leaf in place the table will seat 10 very comfortably. The top is made of solid oak hardwoods, and has inlet wood keys at the joints in a true Stickley style.